See how the cost adds up. Summary and detailed month-by-month horse expenses listed and discussed. Photographic proof of one of my fence vandals is below. This is Moonshine checking out the grass on the wrong side of the fence. Valentine and Cash do it too, though Valentine is such a giraffe, he goes over the top of the fence instead of through it. The fence posts are starting to loosen from all of that horse weight pushing against them. Electrifying is in our future, I think. If you’ve been faithfully reading our blog you know which horse we’ve selected. Mikki mentioned it in her last post. In case you missed it, here’s a recap. Ever since Sinbad left, we’ve been looking for a replacement horse. We needed one anyone could ride and this new horse would become my regular every day horse while I work with Moonshine. Over the course of the last month or so we’ve checked out a total of four candidates: 1) Snowball, a cremello Tennessee Walking Horse, 2) Misty, a spotted Tennesse Walking Horse, 3) Romeo, an Appaloosa and 4) Cash, a spotted Tennessee walking horse. Misty was eliminated early due to inexperience and Cash and Romeo quickly emerged as the front runners. After vet and farrier checks, short rides, long rides, pacing the floor and scratching our heads, we decided we’re ready to make a selection. A while ago, Shari told us that if you’re not careful, you’ll find yourself collecting horses. This seems to be true and here we are with FOUR horses. Here’s why we selected both: Cash makes an excellent gaited horse pair for Valentine, plus he has the paint markings I prefer. He’s a handsome fellow, easy to ride and not as tall as Valentine. But Romeo has barrel racing experience, is also easy to ride and gentle (he’s also handsome). I can learn how to barrel race on Romeo and he’s reserved and gentle enough for the Kid, who we’ve decided will be taking lessons soon. 2) We just bought a two horse trailer. Since Valentine is so big, we’d need a new truck to get a bigger trailer. 3) We only have 3 horse stalls. We need to convert a storage stall. 4) Introducing two new horses to the herd. Romeo apparently is the herd boss in his current pasture. I’ll get some better pictures of them without riders. Our horse world has just expanded! I think we have enough now, though. And on a side-note, our horse friend Shari just bought a big Tennessee Walking Horse that looks a lot of Valentine so it looks like we’ll be riding gaited a lot. More soon. We’ve been mooching off of our horse friends for too long! This weekend we made one of our regular trips to the big city (Atlanta in this case) for provisions and while we were down in Georgia we thought we’d check out some horse trailers. We’ve looked at horse trailers before but we were looking in the $1,000 – $1,500 range and to be honest, most trailers we saw in that range were rusty and worn out. We made some calls and ended up driving almost to Alabama to look at a trailer owned by Kim at the Prancing Pony Equestrian Center. The price was right so we ended up towing home a beautiful gold-colored 2004 CM two horse trailer. It’s extra-tall and extra wide for Valentine, who stands at 16.2 HH. While we would like to have a three horse trailer, our F150 isn’t cut out for that much hauling and we weren’t prepared to buy a 3/4 or one ton tow rig. Thanks to Kim and her husband (whose name escapes me) for making this such an easy transaction. Kim also showed us around her farm and introduced us to her horses, her mini-horses, goats, chickens and puppies. We wished we lived closer so we could ride with her. The Prancing Pony near Carrollton, Georgia also does birthday parties and camps for kids interested in farm animals, especially horses. Now we can load up and head out to our local trails without asking our friends for a ride. We’re thankful for generous friends but are happy we can haul our own horses. We just need to peel off the stickers and come up with our own logo vinyl. You can also find this list by visiting their website and clicking “Coupons” on the top menu. Note: Farnam isn’t a sponsor and we’re not affiliated with them in any way. A few years ago we lived in Arizona during the height of the big real estate boom. We saw the price of houses in our neighborhood jump from $150k to over $300k and the desert all around Phoenix developed. It seemed even the least attractive homes in the worst neighborhoods were suddenly very expensive. I couldn’t figure out where all the money was coming from. How could people making $40k a year afford a $300k house in need of a new roof? Years later we have our answer and the “housing crisis” continues. I feel bad for those who had to pay twice what homes were worth, only to have their mortgage payments skyrocket and the value of their houses plummet. But I hadn’t even considered the impact this might have on horses in Arizona until I read an article a few days ago on azcentral.com (the website of the Arizona Republic newspaper). Though I’m not a fan of E.J. Montini’s controversial political views, his column post “Abandoning houses, horses and history” was well written and eye-opening. Mr. Montini interviewed Holly Marino of the non-profit Horse Rescue of North Scottsdale and discovered that people in the Phoenix area are dropping off and abandoning their horses at an increasing rate. When people can’t pay their mortgages, they can’t pay to feed or board horses. The rescue went from having around a dozen horses to having 60…SIXTY. I know what it costs to feed and maintain three horses but I can’t imagine sixty. They’re struggling to find a way to pay the expenses while looking for good homes for the horses. The impact of the huge increase in bankruptcies and foreclosures in Arizona extends beyond people to their pets, including horses. I’ll guess it’s a problem in other previously-hot housing markets like Southern California and Florida. It’s sad for the horses and sad for the people, many of whom are probably as close to their horses as we are to ours. I’ll be traveling to Arizona in the next few months and will try to stop by the Horse Rescue of North Scottsdale to talk with Ms. Marino about it some more. If you’re close by and would like to help, visit their website (they have a very nice website) for more information. They’re in need of blankets, hay, feed, money and more. Even a small donation of $10 can buy a bag of feed. If you’re not close by, consider helping out your local horse rescue. The housing crisis is impacting communities around the U.S. Most rescues are non-profit and in need of financial and/or physical help. A few days after our horses got loose, we were talking with some friends and discovered that the little runaway scene the other night did actually cause some property damage. The friends that caught our horses for us had a suspicious break in their electric fence. Now there are other ways this can happen but it’s likely our horses ran into it, probably got the shock of their lives and scooted off, wide-eyed and wide awake. They ended up in the front lawn of the house and that was the beginning of them being captured. It’s a good thing our friend’s cows weren’t in that pasture or it could have been a bigger problem. We, of course, offered to pay for the fence repair and it caused no ill-will but it goes to show you horses getting loose can turn out to be a big deal. At least here in Tennessee property damage caused by loose animals in the responsibility of the animal owner. Even car insurance companies will sue animal owners to recoup damage expenses. We have learned quite a lesson here. Of course we didn’t let them out intentionally and have always been concerned about leaving a gate open but now we triple check! Speaking of hay, the word from the hay farmers in east Tennessee is that 2007 is shaping up to be a very bad year for hay. The first harvest of the year was about half it’s normal size and the lack of rain since the first harvest could mean there is no second harvest. In Tennessee, we had a hard freeze well into spring that seems to have slowed the growth of just about everything this season. That’s probably the culprit of the smaller-than-normal first harvest. Local farmers say we’re in the drought end of a 10 year moisture cycle in these parts. What all of this means for those of us buying hay in east Tennessee is high prices and low availability. Last year feed stores were selling 30-40 pound square bales for up to $5.50 each last winter. I wonder what the price will be this year. If these farmers are correct, the best time to purchase hay is right now. As long as we keep them away from moisture, the bales will easily last and we have the room for it now. We’re planning on stocking up on round bales for winter and square bales for daily roughage. Worse-case scenario, we’ll supplement this winter with bagged alfalfa but I’d rather not do that. If you live in the southeast, this might be a good year to consider building some hay storage. Luckily the midwest seems to be having a wet summer so you horse owners out there are probably in good shape. Heck, we might be importing hay from you guys this year! I just got caught up on our year-to-date horse expense list and chart. 2007 is shaping up to be more expensive for us as horse owners. It looks like the biggest reason for that is because we’re just coming off of the cold months and winter is definitely more expensive for maintaining horses. Last years expense list started in summer. Now that the grass is growing and our horses are spending less time in the barn, our expenses are going down. If it wasn’t for farrier expense in April, our monthly total would have been only $74. But horses (usually) need shoeing! We find ourselves using more wood pellets these days, as it makes our job cleaning stalls each day much easier. We got some good deals on more expensive feed from Purina and now we’re hooked. We really like Omolene and Strategy. I think we’ll stick with Strategy for now, which sells for about $3 more per bag than local feed-store sweet oats. We’ll also be cutting back slightly on the amount of feed we use. We’ll start buying fly parasites again this month (May). We tried them last year and they worked. Today I noticed TONS of flies in the barn. We should have ordered the parasites a little earlier. On an administrative note, the horse expense list page is looking cluttered to me so I’ll be redesigning it. The information is good, it’s just getting hard to read. Our 11 month average is $157. Last week we attended a Purina Horse Owners Workshop presentation at one of our local feed stores here in east Tennessee. Purina seems to put these on annually and we attended a similar presentation last year at a different feed store. The objective for Purina is obvious: convince us to buy Purina brand horse feed. Even though we expected part of the event to be a sales presentation, we were interested in the opportunity to listen in on a question-and-answer session by cowboy and “horse whisperer” Sam Powell. Sam offers lots of good advice every year. If you have the opportunity to hear him speak, we highly advise it. Check out his schedule at www.asksampowell.com. Oh, and an excellent barbecue dinner was provided at no charge to participants but you have to RSVP. This year supper included barbecued chicken and all the fixings, as well as a delicious desert. Tasty and filling (thanks Purina, Critter Country and other sponsors!). Product samples and literature were available and enough door prizes were given out that it seems almost everyone won something. Purina handed out special buy-two-get-one-free coupons and other discounts to entice us to buy their brand of feed. 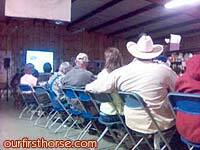 So when next year rolls around, if we get news of another Horse Owners Workshop, we’ll definitely be signing up again. It was time well spent. We’ll write later about how we’ve been using Omolene 100, Purina’s sweet oat blend for “active pleasure horses”. For now, I’ll say we’ve been very pleased with it, even though it is a tad more expensive than the feed store mix. More about all that later. Have you been to one of these presentations yet? What was your impression? By the way, we have no connection with Purina or Critter Country and were not paid anything to say nice things about them. For more information and to see if they have a Horse Owners Workshop near you, visit the Purina website.